Sunday night calls for a pamper night! Yes it is the one evening I try my best to spend a couple of hours just relaxing… and what better way to to do that than with a face mask. Me and my housemate are always experimenting new recipes but this time we went the extra mile and decided to try a nutritional recipe for your FACE. The veggie, considered as one of the healthiest foods on the planet, is not only enjoyed for it’s tastiness in guacamole but also known for it’s nutritional and healing benefits for skin. Personally, I actually can’t stand avocado- but my ozzy housemate and everyone else i know love it! So I trialled on Sarah. The veggie deeply hydrates and nourishes skin without any irritation so it is suitable for all skin types – particularly dry and de-hydrated skin. It is also ideal for removing make-up! This DIY at-home face mask is so easy to make with just three ingredients and three simple steps. This recipe makes enough for two masks. I decided to give this Passion deep cleansing face mask a go from Boots – thought I would treat myself on my loyalty card points and I’d never tried a peel off one before. As you can see… it comes out very different to how it looks on the packet. Instead of having a pretty light pink cream on my face, I actually just look heavily sunburned!! My skin did feel pretty soft afterwards though. Have a go and see what you think with this super easy face mask recipe! I don’t know about you but Sunday is always the ultimate day for some pampering! At the end of a (sometimes) stressful week and the ‘I’ll never drink again’ Friday night rolled-into-Saturday night hangover, I just need a day to unwind and treat my skin my skin to some spa-like therapy. I love a good facial but unfortunately you can’t always be at a spa where you can relax and listen to the calming music while someone magicaly turns your skin super soft and blemish-free! So the next best thing is a supermarket face mask! 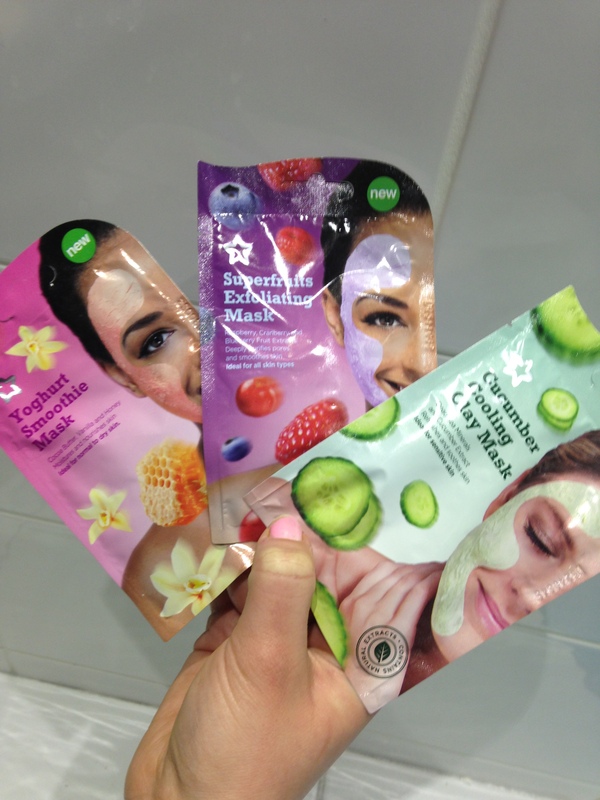 I bought these three from Superdrug to choose from- Yogurt Smoothie mask, Superfruit Exfoliating mask and Cucumber Cooling Clay mask. 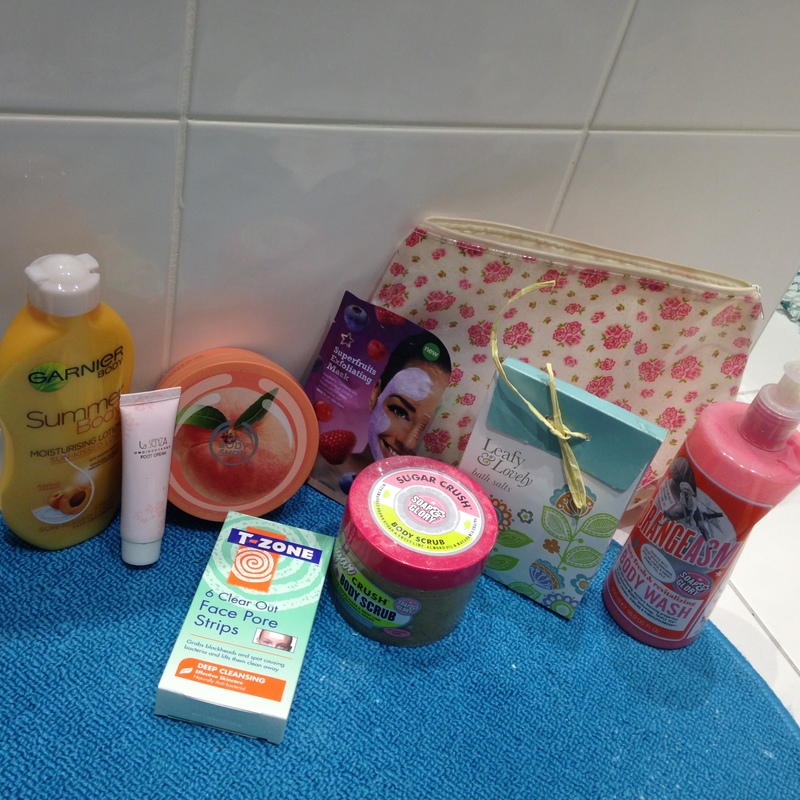 I fancied going for the superfruity scrub one- enriched with raspberries, cranberries and blueberries. It smelt soo good I almost wanted to spoon some from my purple face! The purifying-pore mask definitely did what it said on the packet and made my skin feel super smooth and smell gorgeous. I also tried T-Zone pore strips for some deep cleaning of my face to remove blackheads in target areas. I’ve never thought about using anything like this before because I have never really noticed any blackheads on my skin… until yesterday morning! My skin always goes through bad spells after lots of alcohol. I’d never used pore-cleansing products before but since my sister started using strips for her nose and blagging on about good her skin is now (and sending me hilarious pictures of her wearing the big strip-pretending she’s had a nose job) I thought i’d give it a go. A word of advice though… once you’ve taken your strips off don’t leave them around the house. Not a pretty thing to accidentally pick up! I rarely ever miss a good bubble bath on a Sunday- it’s my me-time tradition and has to be surrounded my heavenly smells. I love Yankee candles so much- they’re all around our flat and my bedroom. This Sunday I lit up my huge Cranberry Ice one which smells sooo good. The key to a good bath is the candles and the bubbles!! I like to add bath salts to mine and tonight I added a cute Sephora bath heart which melts in the bath to let it’s body gel out. This one smelt of raspberry. Mmmm mmm scrub a dub dub! Talking of scrubs you have to try Soap & Glory’s Sugar Crush body scrub because it’s amazing and literally smells like candy and cake! It makes you want to eat it from the pot. Not only does it smell like heaven, it leaves your skin feeling super soft. You’ll definitely be stroking your smooth arms for the next half hour. You’re always told that you have to moisturise everyday if you want your skin to look like the celebs’. I try my best but I do have my favourites I will always use when I can and think work a treat! I like to use a gradually-building tan moisturiser first to build up a little bit of colour when i’m not lucky enough to be soaking up the sun abroad. I don’t know about you but I always feel so much better when my skin’s got a golden glow… much better than looking like a ghost! I definitely recommend using Garnier’s gradual sunkissed body lotion because unlike a lot of products that contain tan it doesn’t smell like biscuits so you won’t rock up to the office the next morning masking a funky smell. Instead it has a summery fruity scent of apricots- much nicer! I am a HUGE fan of the Body Shop body butters- I actually think I might have tried every scent now! They’re definitely the go-to gift for my family and friends whenever they are shopping for presents for me. 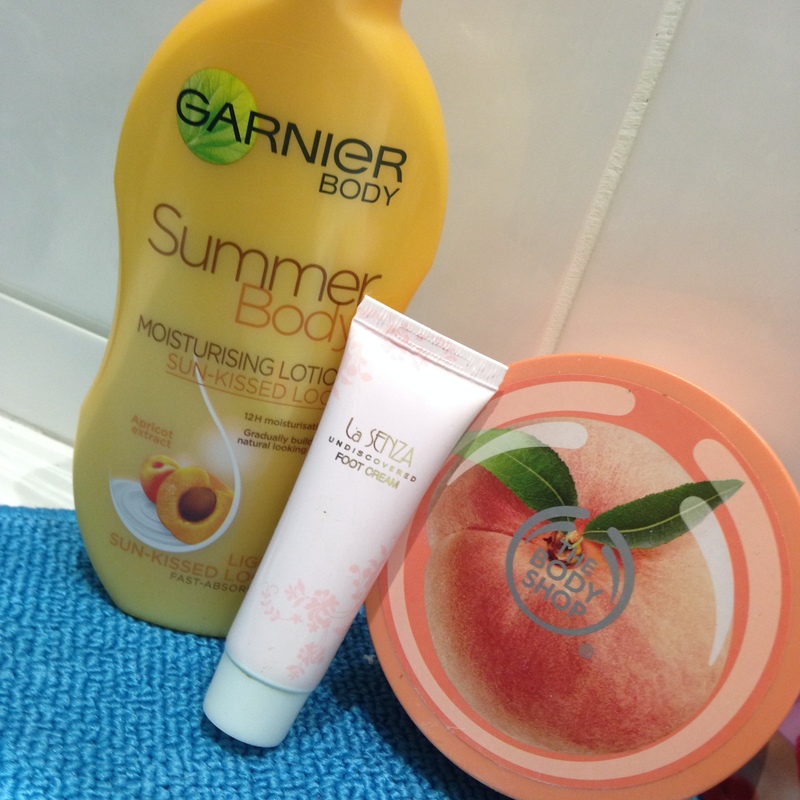 To blend in with my apricot-smelling golden glow, I went for the peach butter. So gorgeous and never lets you down by giving you smooth skin. Now that your body is feeling silky smooth all over, it’s important your feet get just as good a treatment especially after all the Friday and Saturday night dancing you put them through in your high heels! I’ve been using La Senza’s Undiscovered foot cream which I got as part of a Christmas pressie. It’s lovely. Pampering done, it’s time to unwind and relax with a mug of hot lemon- the perfect detox after Friday and Saturday night’s naughty antics. Maybe even treat yourself to some cucumbers on your eyes or a good movie marathon! My favourite thing to do after putting moisturiser on my feet is to put on some cosey socks- especially knee socks… you can’t have a true comfy and cosy night without a pair of these. I love my hot pink and grey Jack Wills ones- they’ve stuck with me for years and are still a Sunday night fave! And to finish it off some much needed beauty sleep- if you’re like me and didn’t get home until 5 am on Saturday morning then you will need it as much as I do to get back into the swing of things for work! I hope you all had a fab weekend and also treated yourselves to some Sunday you time.